When the original fax innovation hit the market, it changed the way the world communicates forever. Once internet fax services became widely available, it revolutionised the business communication sector once again. This powerful technology continues to push the boundaries of innovation and excellence, and helps companies of all economic interests and scopes to save money while boosting productivity. How can internet fax services save your business money? Since there are no limit to the number of accounts you may register, you can provide each of your employees and departments with a dedicated internet fax account. No longer do you need to pay for a dedicated fax line in your office, or spend money on maintaining your fax hardware or its expensive consumables. Instead, now you can use your Internet connection as a fax line and your PC as the fax machine. In the past your office was also forced to print out every fax message to gauge its relevance. This meant you had to pay for spam messages, even when it held no value to the office. 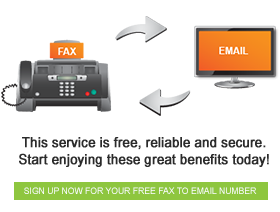 Today, the internet fax can help you achieve the goal of turning your office into a paperless environment. Once you receive a fax, you can merely forward the message to the correct department instead of printing it in a hardcopy. If it is spam, you merely delete the message and you haven’t paid for its printout. These and many other benefits await you as soon as you deploy this incredible technology in your business. ⇐ Save Money With Fax Online Today!